Marinate sliced lean meat with 1/2 tsp of salt, 1/2 tsp of light soya sauce, 1/2 tsp cooking wine, 1/2 tsp sesame oil, a dash of pepper and 1 tsp of corn flour. Mix well and set aside or at least 30 minutes. Heat wok with some oil on medium heat. Add minced garlic and fry till fragrant. Add kway tiao and use chopsticks to loosen. Add dark soy sauce and light soy sauce. Mix well and stir fry for about 5 minutes. Add more sauce if you want your Kway tiao darker. Fry A little longer if you want them charred. Remove and set aside. Heat wok with some oil. Stir fry garlic till fragrant. Add marinated lean meat. Stirfry till Pork is no longer pink. Add prawns and sotong and fry for 15 seconds. Add in homemade chicken stock. Bring to a boil. Add caixin, marinated sliced fish and fish cakes. Add seasonings: light soya sauce, oyster sauce, fish sauce, a little dark soy sauce for colour, some pepper and a dash of cooking wine. Mix well. Taste and adjust accordingly to your taste. Thickened with potato starch water. Drizzle beaten eggs all around. Let it set for five seconds, then off heat and use spatula to gently stir. To serve, place some kway tiao on plate and pour sauce over. Serve immediately with green chilli. To make homemade chicken stock, prepare 4 chicken carcasses and 1/2 dozen of chicken feet. Blanched chicken carcasses and chicken feet in boiling water to remove blood. Remove, rinsed and set aside. Boil about 2 liters of water in another pot. Prepare 3 stalks of spring onion, a thumb-size ginger (rinse and smashed) and 6 cloves of garlic (rinse and smashed). Placed into pot and add blanched chicken carcasses and chicken feet. Bring to a rolling boil for 10 mins and later to a gentle simmer. Simmer for an hour and remove to transfer to a thermal pot. You can simmer for a few hours if you don’t own a thermal pot. 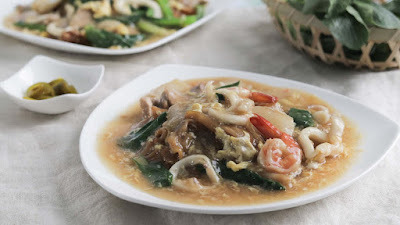 Watch this video recipe at Singapore Home Cooks cooking channel.